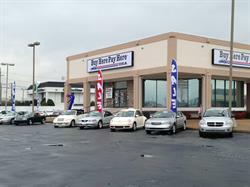 CLEVELAND, TN--(Marketwired - February 11, 2015) - Buy Here Pay Here USA, the area's premier pre-owned auto dealership, is pleased to announce the grand opening of its new Chattanooga location. The new store, located at 153 and Shallowford Road, will be Buy Here Pay Here USA's third and largest dealership, featuring a vast selection of certified pre-owned vehicles. "We are very excited to offer our services in Chattanooga," said Buy Here Pay Here USA President Chris Pendergrass. "The new store is looking great, and we're ready to serve Chattanooga customers with the same great customer programs we offer in Dayton and Cleveland." The Chattanooga store will host grand opening events on Friday, Feb. 27, from 5 - 7 p.m. and Saturday, Feb. 28, from 11 a.m. - 1 p.m. The two events will feature food, drinks, music, and giveaways. There will also be radio remote events featuring food and drinks on Friday, Feb. 13, from 5 - 7 p.m. and Saturday, Mar. 7, from 12 - 2 p.m.
To help celebrate the grand opening, the store is also offering a tax season special -- $300 Today and Drive it Away. Customers who bring in their estimated tax refund may qualify for no down payment (subject to credit approval, see store for details). "We look forward to meeting the people of our new community during the grand opening event," Pendergrass said. "Chattanooga is a great city, and we can't wait to see our vehicles hitting the streets in style." The new Buy Here Pay Here USA of Chattanooga is located at 6008 Shallowford Road, Chattanooga, TN, 37421. To reach the dealership, call 877-794-2227 or go online to BuyHerePayHereUSA.com. Don't forget to check out Buy Here Pay Here USA on Twitter and Facebook. Buy Here Pay Here USA is a premiere pre-owned auto dealership geared toward helping people with bad credit or no credit get a great car and rebuild their credit along the way. The company opened its first lot in Cleveland, TN in 2006 and has since expanded to both Dayton and Chattanooga. Buy Here Pay Here USA has helped thousands of people with previous bankruptcies, repossessions, foreclosures, large medical bills, and other credit issues acquire a vehicle. The company takes pride in offering second chances to good people. To learn more about Buy Here Pay Here USA, visit BuyHerePayHereUSA.com. ©2015 Buy Here Pay Here USA. All Rights Reserved. 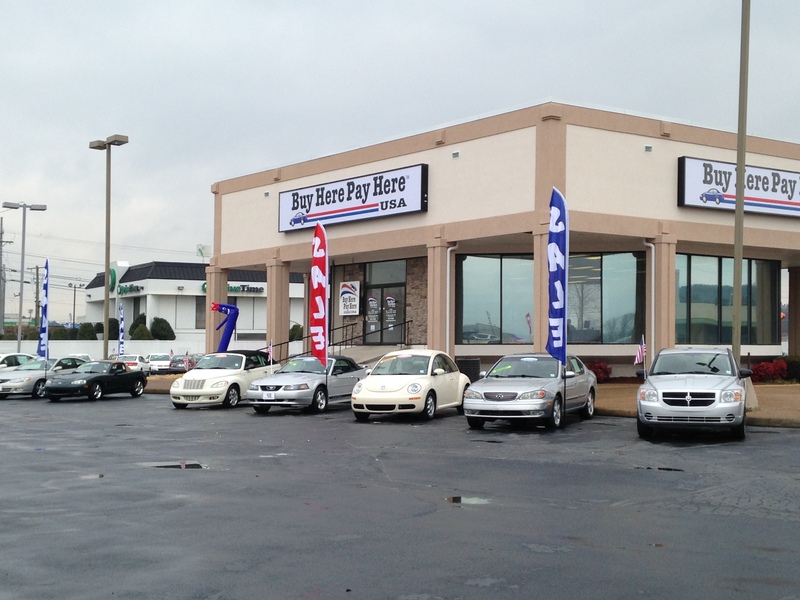 The new Buy Here Pay Here USA dealership at 153 and Shallowford Road in Chattanooga, TN.